As soon as winter hits, many cooks abandon salads and head straight for warm and hearty stews. We recommend to keep on making salads, but just change your tactics. Instead of crisp, chilled lettuce and cucumber, use warm, roasted veggies for the perfect cold weather side dish! 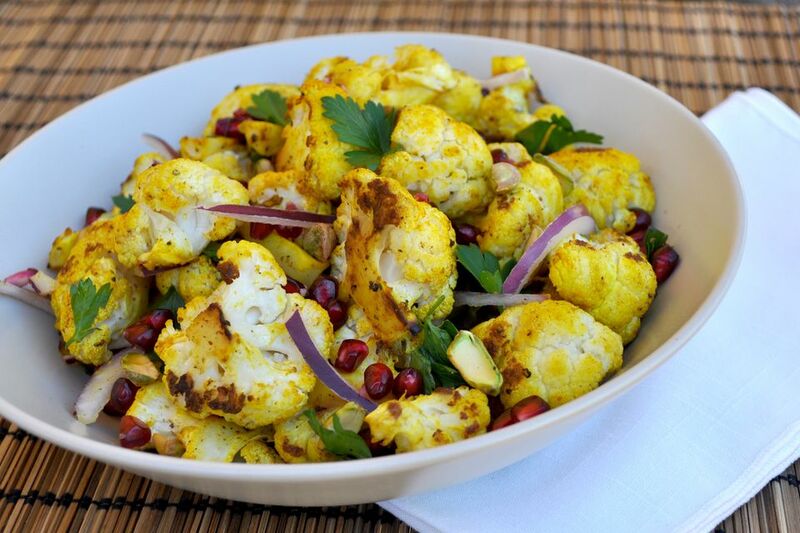 On a large baking sheet, toss the cauliflower florets with the oil, turmeric, and cumin. Spread out into a single layer and season with salt and pepper. Roast for about 20 minutes, tossing once, or until cauliflower is crisp-tender and browned in places. Meanwhile, place the red onion in a small bowl and cover in cool water. Let sit for 20 minutes and drain completely. Toss the hot cauliflower with the lemon juice and honey. Let cool for a few minutes until no longer hot. Add the roasted cauliflower to a large bowl. Top with the drained red onion, pomegranate seeds, parsley, and pistachios. Roasting Might Be the Best Way to Enjoy Cauliflower.